I bought this duvet cover as a birthday gift for my father. It has a nice, solid, soft cotton feel to it. My only concern is that it wrinkles easily. In navy, khaki, and sail-cloth white, this ensemble set dazzles guests and hosts alike. The uniquely vertical splicing and striping of color fields provides a visual punch, while crisp, white stripes run alongside its joined hem, also reflected on the matching standard shams. 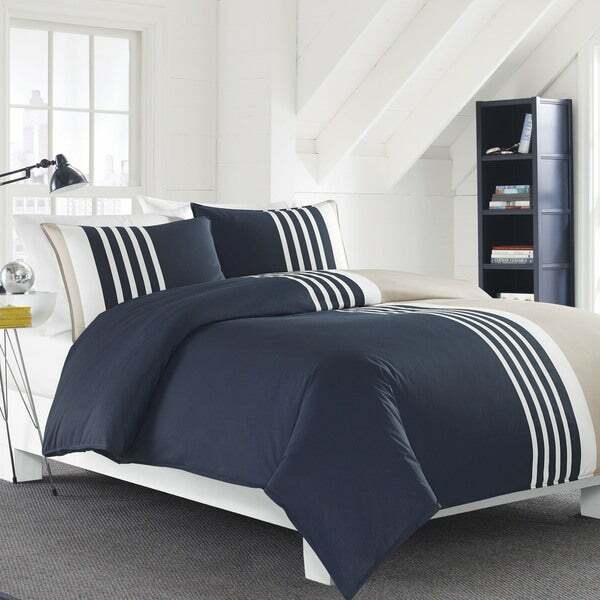 Works perfectly with Nautica basics, or paired with European shams and textured throw pillows. Set includes 1 duvet, 1 sham with twin and 2 shams with queen/king. I thought I was receiving the full duvet but I guess I miss read COVER! Now, I have to go and buy the duvet insert. Smh! The reason I gave a 3 star because they sent me two different sized shams! One is for a large set and the other is for a full or a queen set! Smh! Do Better, Please! I’m not sending it back due to me having to wait again...online ordering is convenient but when you get something that’s not the right fit or size then that’s when online ordering because a damn nightmare. I’m just going to slow down and buy directly in store if I can find what I need. Loved the quality and color. Looks great. Great set! An excellent price! These sheets are soft and comfortable, looks great even after washer and dryer. As always, Nautica design is clean and nice. High quality. Product as pictured. The cover is to thing . I was expecting something thicker. Material is not the best. "What is the thread count on this set?" "From other websites, this appears to be a duvet, not a duvet cover. Can you please clarify? Does it open up and you put another duvet in there or is it more like a comforter already?" "No fitted sheet? How is this a set without a sheet?" This set includes 1 duvet, 1 sham with twin and 2 shams with queen/king. A coordinating sheet set will need to be purchases separately. "Are the pillow shams included in the set"
This set includes the duvet cover and 1 sham with twin size, 2 shams with full/queen and king size.